The right apparel and rain gear are a must for any sportsman. Memphis Net & Twine offers rainwear, boots and muck boots, jackets, headwear and more to keep you drier and more comfortable when you're out fishing or hunting. 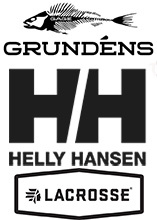 We carry several items by Helly Hansen, a Norwegian company that has been making outdoor sports gear and foul-weather fishing gear since 1877. Our Helly Hansen rain gear and fishing apparel includes hooded parkas, bib pants, hooded and non-hooded rain jackets, and Aquaseal Wader Repair Kits to keep your Helly Hansen bibs properly waterproof. Another high quality brand we carry is Grundens Quality Foulweather Gear. Our Grundens rainwear and fishing apparel includes rain jackets and bib pants in several different colors. Of course, bibs and jackets alone won't keep you dry if you don't have the right waterproof boots for fishing! We offer durable, high quality muck boots, knee boots, hip boots and waders so you can go wherever the fish are! We also carry boot and wader accessories such as boot hangers and dryers so your boots can get dry and ready for the next fishing trip, plus wader belts, boot repair kits, wader suspenders and more. Be ready for anything your fishing trip throws your way with high quality rain jackets, bibs, waders and boots from your fellow sportsmen at Memphis Net & Twine!